Few moments combine relaxation and exhilaration like the instant you release your weight onto a floating raft or kayak, push off land and join the flow. All the stress and commotion of gear wrestling, food planning and daily schedules are muffled into deep oblivion like sounds dampening underwater. The current pulls, you paddle and the world passes to the side — powerless against the alternate reality of river time. But on this particular trip down the Grande Ronde River, the blissful reverie only lasts 15 minutes or so until my friends and I encounter a bit of unexpected adventure. My pals Dave and Maggie are newcomers to the inflatable kayak they share, and they are still figuring out how to steer it as the current pulls them toward the first rapid. Crashing into the wave is normally of little consequence, unless — as in this case — it involves simultaneously colliding with a large oar raft. The young man paddling the oar rig is not in our group, and he is looking in the opposite direction. I am 50 yards upstream and powerless to do a thing. From where I am, things don’t look good. But at the last second, the young raft captain sees the kayak just in time. He stops his back-paddle motion before it clotheslines my kayaker friends. Dave and Maggie float past, unscathed, into calm water. I sigh in relief. After this, we all paddle ahead together and ease into the Grande Ronde’s easy rhythm: quickly flowing flat stretches linked together by Class III wave-train rapids. It’s just enough action to keep you alert, but nothing too crazy that more skilled rafters can’t handle. Remember that river rapids always pose safety challenges, and if you’re a true beginner, you should consider paddling with a professional guide. Moments like this are why I’m drawn to river trips. There’s always a sense of discovery and surprise when being pulled around new bends. I should know; I’ve been paddling rivers for over a decade, mostly in Georgia, Alabama, California and Washington. My wife, Christine, and I moved to Oregon in early 2015, and we’ve quickly learned it’s a paddler’s paradise. We’ve made it a goal to explore all of the rivers designated Wild and Scenic — essentially, the river equivalent of National Park status. And since Oregon has more Wild and Scenic rivers than any other state (48 in all), we have a lot of floating in store. For this trip, we’ve corralled some friends and hit the road for Eastern Oregon, eventually following Highway 82 as it descends into a forked valley, where the Minam and Wallowa rivers meet. After our long drive east through the scrubby, sunburned landscape of I-84, Minam is a bustling recreational oasis. Here we prepare for our float at the Minam Store and Motel — essentially the region’s River HQ, which offers rentals, shuttles and permits. There’s a bit of red tape, but it’s nothing compared to more popular river runs elsewhere. At the Minam Store, we register for a permit (free and unlimited), assure them we have the proper human-waste removal kit (specially lined bags and bucket with lid), rent a few inflatable kayaks, and buy fishing licenses and ice. For a modest fee, the store will shuttle one of our vehicles to the take-out, 2.5 hours north at Troy. Most parties on the Grande Ronde cruise in mini flotillas of rafts — the easiest, most forgiving crafts with the largest volume to haul lawn chairs, tables, extra beer coolers, horseshoes and T-bone steaks. Our river party includes a hodgepodge crew of three solo inflatable kayaks, Dave and Maggie’s tandem, and my plastic sea kayak. Our crew quickly learns that “wild” and “scenic” are the perfect words to describe the scenery: no roads or houses, just a clear river cutting through a V-shape canyon speckled with pine and fir trees. Before the sun sets on our first night, we find one of the many sand-and-pebble bars for camp. For a shower, we jump from a rock outcrop upstream and catch the easy current down to camp, our skin blown dry in minutes by remnant gusts of warm air. 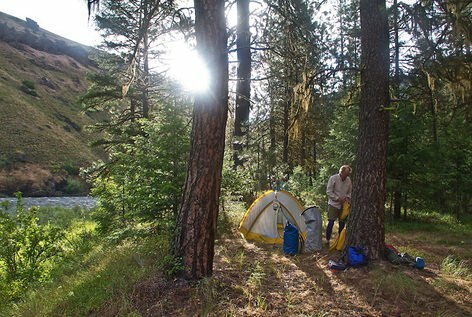 Now, a word of wisdom for fellow river rats: Three days is ideal for the Grande Ronde. It’s enough mileage to stay busy but with no rush. One full day of river time in the middle makes all the driving and planning worth it. On our second day, we wake up to a morning of cool shade that lasts just long enough for riverside coffee, before the sun crests the ridgetop and bathing suit temperatures arrive. Everyone’s in their groove today, and we glide downriver, splashing through the Class III waves of Martin’s Misery Rapids, stopping for lunch and a swim on a broad sandy beach. As we float on, the river twists deeper into the mountains, cutting through vertical walls of deep red horizontal bands or chalky black waves of basalt. Don’t be surprised if you see more eagles, osprey and deer than people. As afternoon turns into early evening, we ride river time toward sunset and find another sandy beach shaded by cottonwood trees for camp. Here we forgo a campfire and rely on stars for entertainment. Relinquishing control to a river’s pace is liberating. Sometimes it feels like gaming the system; floating weightless seems too easy, too unearned. But the river won’t let us linger. It’ll leave us high and dry at our truck in Troy by lunchtime tomorrow. For now we lie on the cool sand with the hard line of the ridgetops black against the silver sky, the moving water a subtle white noise you have to listen for to hear. Photos of the Grande Ronde River from top: Michael Hanson, Leon Werdinger, Dennis Frates, Joel Rogers. 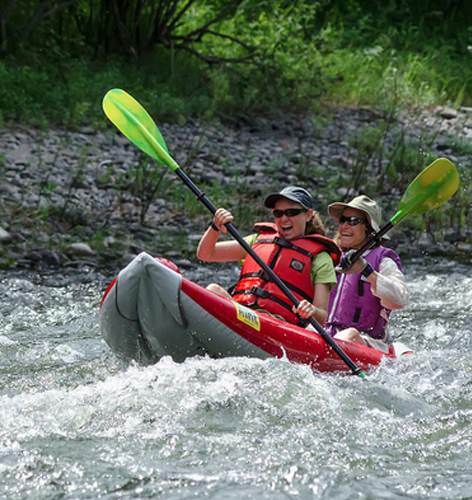 When your rafting friends talk about rivers, you’ll hear them mention classes. These designations are similar to rock-climbing or ski-run designations, and they range from Class I (easiest) to Class V (expert only). Here’s a quick introduction to river classes to help you find the right one for you. David Hanson is a free-range journalist, working the pen and the camera for national publications, organizations and commercial outlets — mostly concerning conservation, adventure and social justice issues. The Georgia native, his Puget Sound wife, their daughter Ada and a few bikes and kayaks have found their home in Hood River.